There are a number of chemical compounds that are good for the skin, and one of the most versatile in allantoin. This compound can be found naturally in most animals and plants, and is also synthesized in laboratories when being used for commercial purposes. Allantoin has a number of skin care applications, and is thought to have moisturizing effects as well as properties that help create smooth, healthy skin. Although the ingredient’s name may be difficult to pronounce, it is considered to be a relatively safe chemical in skin care products, as it has a low instance of side effects. Allantoin is found in a number of different products, such as acne scar treatments and moisturizers, and is usually safe for all skin types. If your skin is rough or pitted with scars from serious or chronic acne, then products that contain allantoin may be a good choice when it comes to smoothing and healing the imperfections. This ingredient can also soothe the skin without causing irritation, which as important factor if you’re using an acne medicine that contains salicylic acid or benzoyl peroxide. Allantoin also provides a natural protectant for healing skin and is believed to promote cell regeneration. By stimulating the natural rejuvenation process, allantoin can help get rid of acne scars and create a more balanced skin tone. 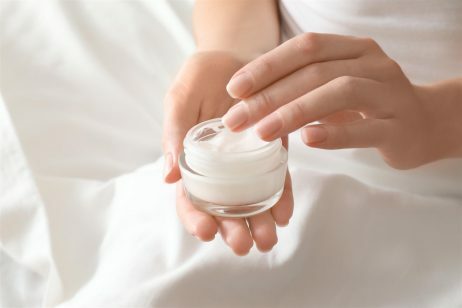 There are many products on the market that help moisturize and smooth dry flaky skin on face and hands, but many of them contain potentially dangerous or irritating ingredients that may harm sensitive skin. Lotions, clarifying creams, and moisturizers that contain allantoin may be a viable choice for those who have sensitive skin and have experienced negative reactions to other skin care products in the past. Not only does allantoin help skin to lock in moisture, the chemical also encourages skin to shed dead cells and grow new ones, which promotes healthy cell development and prevents dull, sallow skin. If you have sensitive, dry, or scaly skin, then using products that contain allantoin may benefit it by moisturizing, protecting, and healing all at the same time without causing any further adverse effects. Even in its synthesized form, allantoin is non-irritating and can be used on the skin daily, although people with sensitive skin are advised to test the use of this product gradually. Those with sensitivities to cosmetics may benefit from the use of products that contain allantoin. 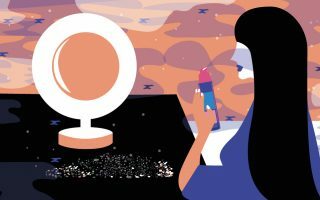 Many different cosmetic products contain this non-irritating compound, such as concealer, foundation, and lipstick, among others. If your skin is prone to rashes and other irritations when you wear even the best drugstore makeup, then you may want to consider shopping for cosmetics that contain allantoin to reduce the risk of breakouts and other reactions. Not only is this chemical less irritating than other compounds often present in cosmetics, but since it also moisturizes the skin, it may mitigate the effects of other, harmful ingredients. If your skin is prone to irritation when you wear sunscreen, then consider switching to a brand that contains allantoin. Not only will it provide you with UV protection, but it will also moisturize your skin and encourage healthy cell development as the product blocks UV rays. While the chemical itself does not block UV rays, it is often included in many sunscreen products to help reduce irritation. However, do keep in mind that any chemical has the potential to irritate the skin, and even cause a serious allergic reaction. Therefore, if you have highly sensitive skin, be sure to first discuss using products with allantoin with your dermatologist. While I admit soothe is a great relief for me with my psoriasis, I cannot afford to purchase it at this price. I have psoriasis over 80% of my body and I am not a small person. Even a thin coat can use an eighth of the container so I only use it when I’m desperate. In thinking about the other options, I did use other medications that have warning labels that include the possibility of dying from them. So, this is by far a better option but a formal costly one. Also it only offers relief not a cure. I guess if I had infinite resources, or a part of the study we are by the medication was offered to me freely I would be able to see/they would be able to see what the long-term benefits would be for us psoriasis suffers. For the time being I buy it on eBay and sometimes can get it for one third of the cost. I did forget to add that the 2 main active ingredients are Allantoin and Dimethicone. To me.. priceless. I joined the company to buy at cost.. I dont sell.it but can refer unless you just go onto Google to research buying it. The makers are the same 2 dermatologists who make Proactive. Rodan and Fields sells a product regimin line called Sooth. After 90 days my cystic acne is gone and my rosacia has not had a flare. Years of skin, wind, sun and enviroment damage healing and even reversing as I near 50.